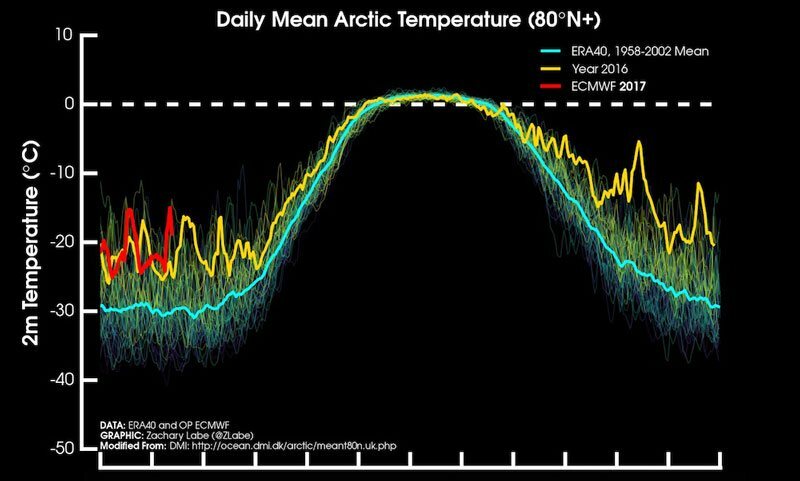 Here’s your monthly reminder: something just isn’t right in the Arctic. February continued a string of record or near-record monthly sea ice lows. 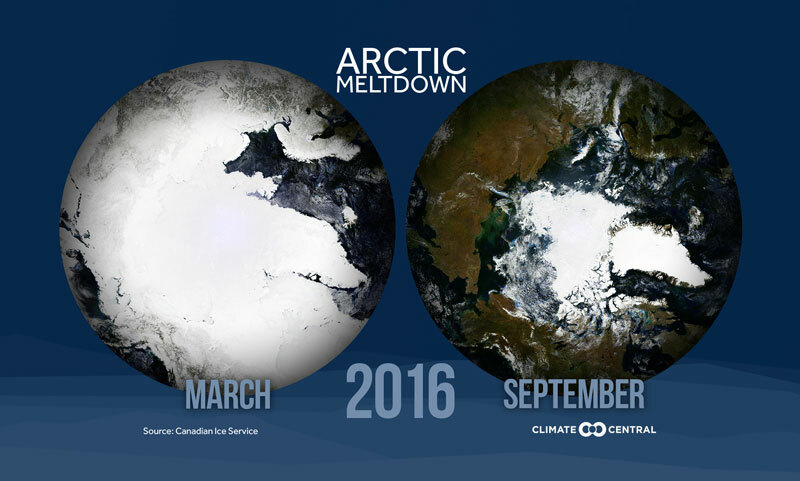 Warm weather ensured Arctic sea ice hit its lowest extent ever recorded for February. Sea ice covered 5.51 million square miles, which is 455,600 square miles below average or a chunk of missing sea ice four times the size of Italy. That just isn’t normal. February sea ice has declined since the start of satellite observations, hitting a record low in 2017. Parts of the region averaged up to 9°F above normal, according to new data released by the National Snow and Ice Data Center. In what’s been a recurring theme this winter in the Arctic, incursion after incursion of warm air has kept the region astonishingly mild for this time of year. That’s slowed sea ice growth to a crawl and even reversed it at times, resulting in the run of monthly lows. September saw sea ice bottom out at its second lowest extent on record. Since then, every month save December has set a record low (and December was the second-lowest extent so it’s not like sea ice was plentiful then either). 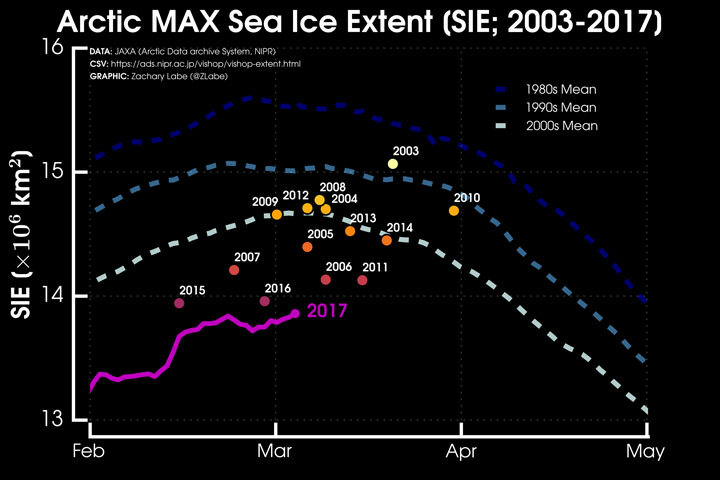 All Arctic watchers’ eyes are on the annual sea ice peak and whether 2017 will mark the third year in a row of a record low maximum. 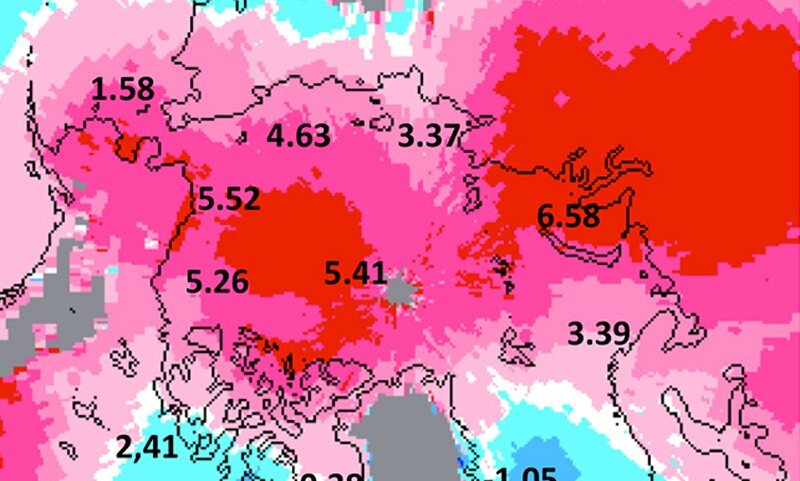 It appeared to peak in late February and then started to decline. Scientists haven’t officially called that the peak, however, since recent days have seen sea ice start to grow again as the temperature dropped. Where this year’s maximum falls is one data point in a long trend of decreasing sea ice. 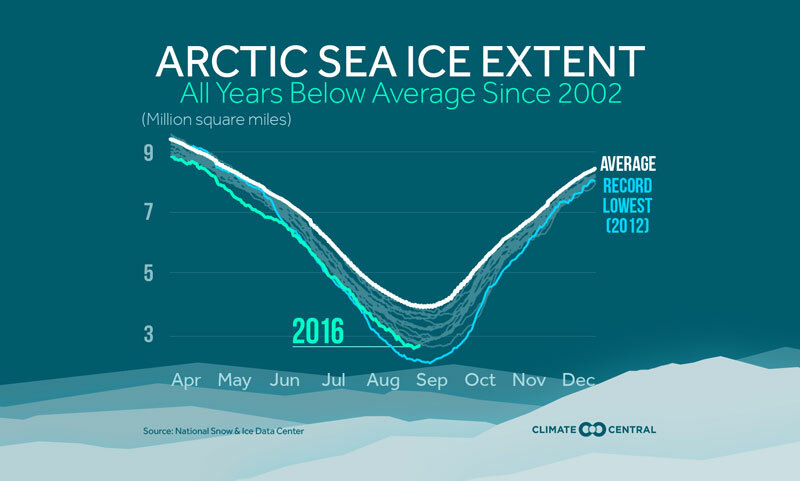 The sea ice maximum has declined by 3.2 percent per decade while the minimum has dropped by 13.3 percent per decade. Old, stronger ice is also disappearing, leaving younger ice that melts more quickly in summer in its stead. 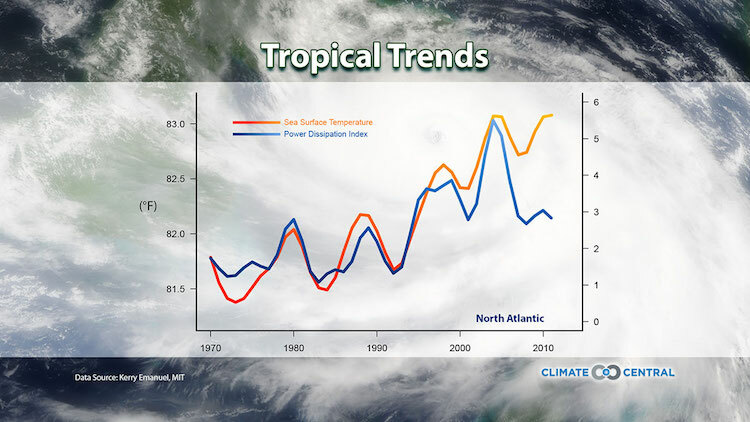 The rapid changes in the Arctic are of utmost importance to scientists studying climate change. 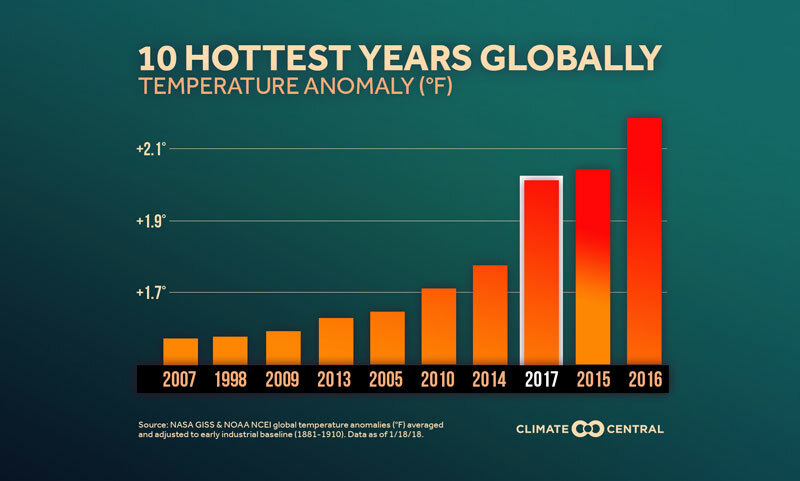 The region, which is warming twice as fast as the rest of the world, is a bellwether of what the rest of the world may face unless carbon pollution is checked. 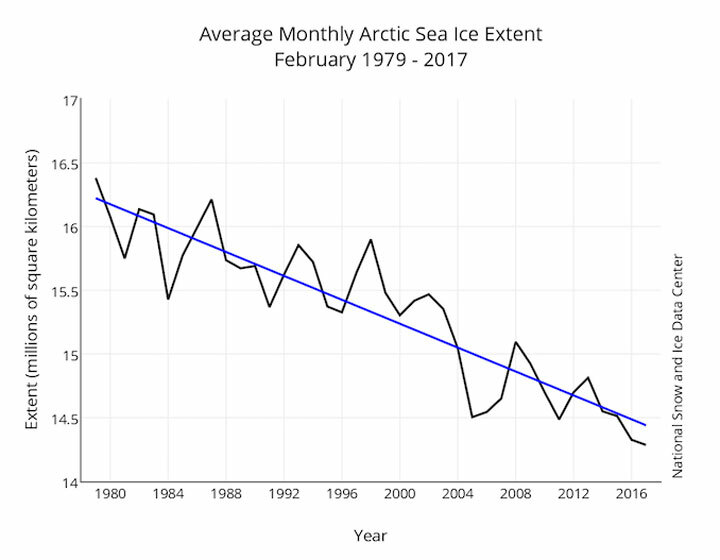 As winter draws to a close, Arctic sea ice extent nears its peak. Scientists are waiting to see if 2017 will be the third year in a row of setting the record low maximum. Yet in an unfortunate twist, researchers could lose their eyes in the sky that allow them to watch over the region. 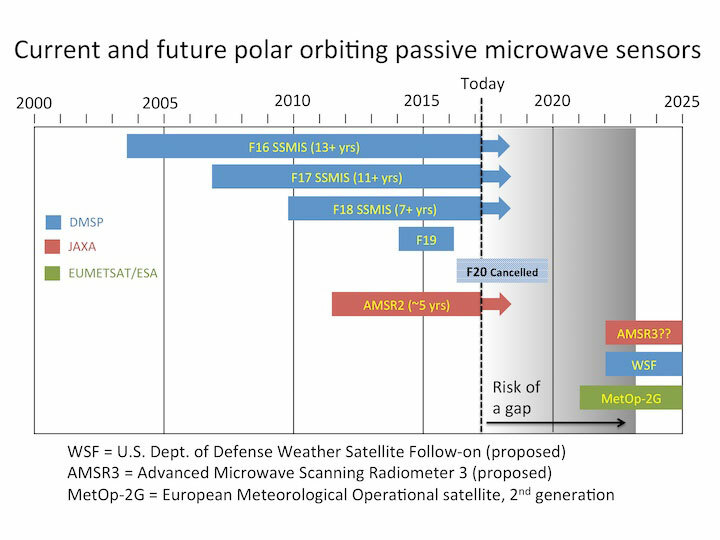 In addition to announcing the record low February sea ice extent, NSIDC sounded the alarm about a looming satellite gap that could create a blind spot for scientists at the top of the world. Scientists are essentially working on borrowed satellite time. There are currently four satellites with sensors that can monitor Arctic sea ice. 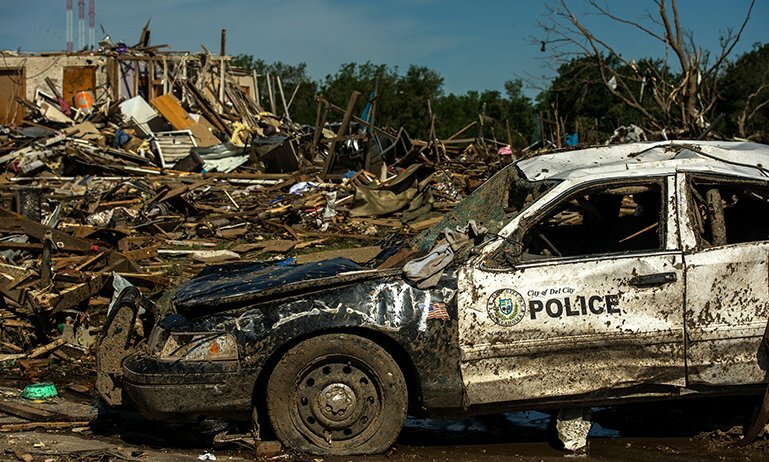 Three of the four, jointly operated by the National Oceanic and Atmospheric Administration and the Department of Defense, are two to eight years past their expected lifespans. Last year, one of those satellites malfunctioned. While the redundancy of the other satellites helped stave off a blackout, there’s no guarantee they’ll continue to provide support into the future. Another satellite under their purview stopped responding to commands last February. There was a potential savior satellite — dubbed the F20 — scheduled for launch last year, but it was mothballed in favor of pursuing new technology. There's an Arctic-monitoring satellite gap on the horizon that could leave scientists without crucial observations. “It's a real loss to have had the F20 dismantled, but Congress would not give the Air Force the funds to launch that sensor even though the instrument had already been built,” Julienne Stroeve, a remote sensing expert at NSIDC, said. The European Space Agency is expected to launch an new satellite to monitor the region, but the launch isn’t on the docket until 2021. 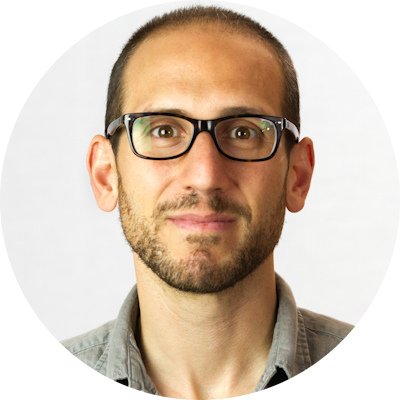 Zack Labe, a PhD student studying the Arctic at the University of California, Irvine, said the satellite data from the American satellite record is consistent over space and time giving it a leg up on other satellite data when it comes to long-term monitoring. “We are at a critical time for sea ice observations, and a disruption would be very bad news for Earth system and climate monitoring,” he said. Each passing day without data would deprive scientists of crucial information about how our planet is changing. That would have knock-on effects on climate modeling and leave policymakers missing out on the best available science to make decisions.